If you are visiting my blog for the first time, I want to welcome you and thank you for stopping by�and for those of you who are returning, I am grateful for your time and your continued interest in coming back to my blog. When talking with friends and family who are located somewhere outside the Boston area, especially when we are away from home for business or personal reasons, we are frequently curious about the weather and ask, �so, how�s the weather there?� Well, the first few days in Rome the weather was sunny and very warm. However, it rained all day yesterday � very hard at times – and we even had a bit of thunder and lightning. Today, it was cloudy with a few light showers, but comfortable temperature-wise. Regardless of the weather, it�s always beautiful in the Eternal City. I’d like to take a minute to inform you about an important Mass and event taking place this Sunday, October 1st, in Boston. At 11:30 am on Sunday, Bishop Irwin will celebrate the Annual Pro Life Sunday Mass – a �Rosary of Life� Mass – in my place, at the Cathedral of the Holy Cross in the South End. Following the Mass there will be a Pro Life Rally and Walk beginning at 1:00 pm on the Boston Common. Participants will gather at the corner of Beacon and Arlington Streets. All are invited to this special Pro Life Mass and Walk. I am pleased to hear that many of our Parishes will have groups attending. As I celebrate Mass on Sunday at Santa Maria della Vittoria here in Rome, I will be praying for all those attending the Pro Life Mass and events back in Boston that same day. The Saints are the masterpieces of God�s grace. Many Saints are hidden from view and remain unknown, but some saints are placed in the world to capture the attention of a society that has forgotten about God. Padre Pio, like Mother Teresa, like St. Francis allows people to glimpse the beauty of holiness, which is a reflection of God�s beauty. People look for happiness in passing beauty, in wealth, in power and in pleasure and are always disappointed. The Saints give us hope in the possibility of happiness, the power of love, the eternal beauty of God. I am struck by how quickly the chaplet of the Divine Mercy and the devotion to Padre Pio have spread all over the world. There is such a hunger for God�s mercy in this broken world. Padre Pio, our Saint, is a Saint of God�s mercy in the confessional. We are told that Padre Pio heard over 1,200,000 confessions, including the confession of the young Father Karol Woytyla. How powerful a spiritual experience to say in Christ�s name �I absolve you of your sins� and to raise a wounded hand to bless and console the sinner. Padre Pio�s whole life announces to the world that God loves sinners and rejoices over the one lost sheep that is found. The greatest heresy of the modern age is the denial of sin. We have lost a sense of sin, a sense of the offense it causes to God, the destruction it does to ourselves and our loved ones, the poisonous effects it has on the fabric of society. We are like people with a deadly disease and in complete denial, refusing to admit that we need a physician. We have made such advances in science and technology and have become so blind to the reality of our human nature. No cures are as dramatic as the ones Padre Pio performed in the sacristy and confessional in the sacrament of God�s mercy. How much hope, how much grace, how much joy filled the hearts of those thousands of penitents, cured of the snake bite of sin like the Israelites in the desert who gazed on the bronze serpent Moses raised up. Padre Pio helped people to look at the crucified Christ with faith and love and experience the healing power of the cross. St. Pio�s compassion for sinners finds another expression in compassion for the sick and suffering. The Casa Sollievo della Sofferenza is a monument to Padre Pio�s concern for the sick and suffering. He reminds us how one of the signs of the Kingdom of God is that the blind, sick, captives are cared for and the poor have the Good News preached to them. 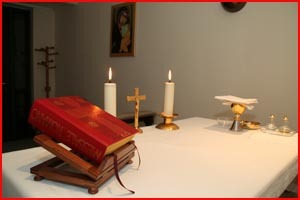 The sick and the sinners who are the protagonists of the Gospel, and the special objects of Jesus� pastoral love are the reason for this shrine. The ministry of Padre Pio is to manifest God�s unfailing love and mercy for His People, especially for the little ones, the sick and suffering and for poor sinners. Padre Pio was a man of prayer, a teacher of prayer and a witness of prayer. The three thousand prayer groups throughout the world show us how his prayer life has been an inspiration for so many. If today we could ask for one grace from this pilgrimage let it be the grace of prayer in our lives. St. Gregory the Great says: �The present life is but a road by which we advance to our homeland. Because of this, by a secret judgment we are subjected to frequent disturbance so that we do not have more love for the journey than for the destination. The suffering St. Pio experienced in his ill health, in the persecution by the very Church he loved, the trials and set backs in establishing the hospital, the pain of the stigmata — all kept before his eyes the pilgrim nature of his vocation. What allowed St. Pio to persevere was the intense prayer life that he lived faithfully. He prayed more in a week than most people pray in a year. The test of authentic prayer is growth in goodness, growth in humanity, greater serenity in living and in facing hardship. Above all genuine contact with God effects a real displacement of self as the center of our existence. Prayer is not withdrawing from the rest of humanity. It is more like a wedding feast to which we welcome all who cross our path. A strange thing takes place in prayer. There is a mysterious coupling of our own life with the lives of others – an embrace that includes the whole of humanity. At first prayer stems from a sense of personal neediness. Prayer progressively becomes less a self-centered plea for personal deliverance than a universal cry for help and for the coming of God�s kingdom. Prayer and suffering transformed the life of Padre Pio and made him a living icon of God�s unfailing mercy and love. Too often we try to follow Jesus at a safe distance, like Peter after he fled from Gethsemani. Padre Pio�s life and teaching encourages us to climb Calvary to join Jesus in the moments of greatest pain and greatest love. In today�s Gospel, planted at the foot of the cross are these few brave disciples. I am sure that Mary�s faith and courage was a source of strength for all of them. Mary stood at the foot of the cross. At that dramatic moment, before His death Jesus gives us a gift, His most precious possession, His Mother. Behold your mother. Mary is now not only Jesus� Mother. She is also our Mother. For Padre Pio, as for St. Francis, the cross was his book, the book where he read the greatest love story in history. Padre Pio lived his life planted at the foot of the cross in the company of Mary. Mary full of grace, the costly grace of discipleship, the grace that allowed Mary to renew her fiat, her yes to the Lord even in the face of the cross. There by the cross is our Mother, Our Lady of Grace. Recently Our Holy Father Pope Benedict said, �He who believes is not alone.� Here we have a host of witnesses. We stand before the beloved Cross of Our Blessed Savior, we stand with Our Mother, Our Lady of Grace, and Padre Pio. We are not alone. When the Apostles came down from Tabor, they carried in their hearts a glimpse of God�s Glory. When you return to your homes, share with your families and neighbors the graces of this pilgrimage and the message of our beloved Padre Pio: preghiera e carita e la gioia del sacramento del Perdono. A visitor to the blog inquired about my mention of saying Mass at the Vatican residence before going to dinner last night. 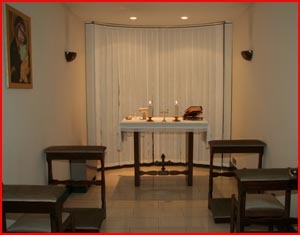 There are small chapels in the residence for that purpose. It�s the ideal that priests say Mass every day. It�s the greatest prayer that we can offer for the Church and for our people. That was why we were ordained. I would never miss the opportunity to say Mass. Each time we say Mass, the whole Church is present, even if we are alone. In the Mass we pray for the Pope, the other Bishops, for the living, for the deceased�everyone who has ever been part of the Church is part of the celebration of the Mass. It�s the greatest service that we can give. To Padre Pio, his celebration of Mass was the most important part of his day. He would to take hours to celebrate Mass. I had a very nice dinner meeting with Msgr. Deeley last night. Msgr. 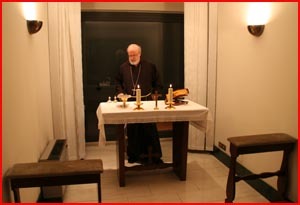 Deeley holds a position at the Congregation of the Doctrine of the Faith, an office that was once headed by Pope Benedict, who was at that time, Cardinal Joseph Ratzinger. Msgr Deeley was once Pastor at St. Ann�s in Quincy. I have asked him to contribute a post to my blog sometime in the next few days. I believe that he can offer you a perspective that is unique, as one of our own, a Bostonian, who is now living in the Eternal City and working in a very important post at the Vatican. I hope that you will find his view from Rome to be informative and interesting. In the coming days, I would also like to make time to share with you my visit to the Ges�, the Mother Church of the Jesuits, and where Saint Ignatius is entombed. Good Night and until my next post�.